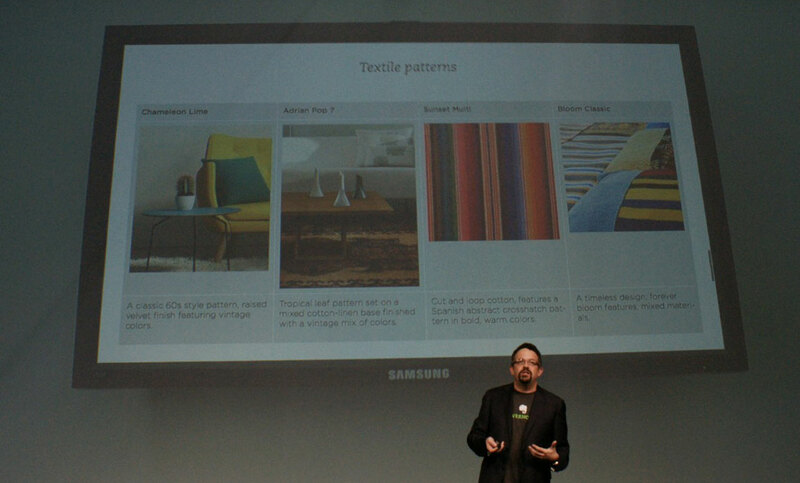 At today’s Evernote Conference, CEO Phil Libin introduced a bevy of new products and upgraded products from the stage during his keynote. Libin showed off an updated web client, new Moleskin planners, an upcoming presentation mode and new mobile apps coming from the super charged note-taking service. For anyone that’s ever had to create a PowerPoint presentation, Evernote hopes to make creating those presentations a bit easier with the upcoming Presentation mode. Hit the presentation button and you get a presentation of your note that’s automatically formatted including automatic screen breaks that you can just scroll through. To edit the presentation you can use the layout editor that pops in from the right side of the screen to adjust the screen breaks. “It’s not meant for slides or paper, it’s meant to work on different size screens” said Libin. It also has a software “laser pointer”available in Star Wars lightsaber colors. Plus you can just return to the regular Evernote layout and make changes and they automatically update the presentation. You can also create a presentation out of multiple notes. This is available on desktop and mobile. Presentation mode will arrive in November. 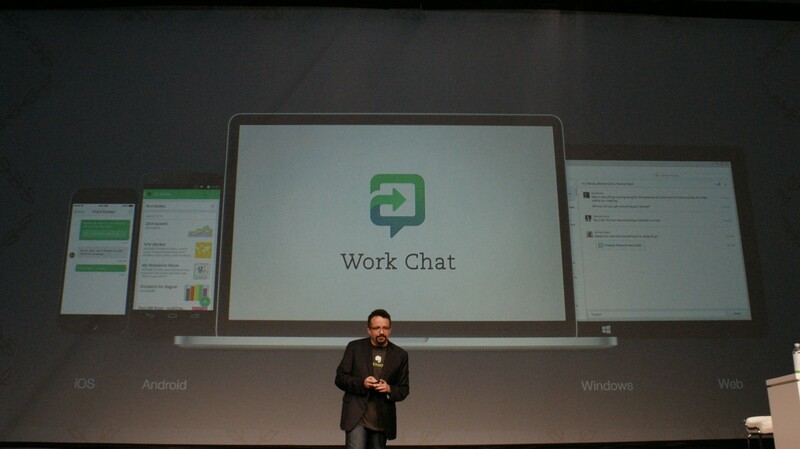 New Evernote also introduced a new web client that’s available today. Built to remove distraction, as you write, everything, else melts away leaving the content front and center. Options and formatting tools only appear when you need them and if you don’t have tags or shortcuts, it doesn’t show those options in the web client. It’s available today as an opt-in feature. You can still use the old client if you want, but it will eventually go away. Libin also introduced the Evernote Moleskin Day Planner that’s available today from the Evernote Marketplace. When lying flat, the open notebook’s pages represent a single day that when photographed with Evernote the app understands the date and adds to your Evernote with that information. While it seems odd for the software company to be selling paper goods Evernote has actually sold 500,00 Moleskin notebooks in the past 12 months. Two new apps were also announced. The new Scannable app recognizes and ingests documents without you having to actually hit the shutter button and it controls the ScanSnap Evernote Edition and auto uploads scanned images to the app. Scannable and Penultimate 6.0 (a new version of its app for the Evernote Jot stylus) will come out later this year. For business users, Libin dropped a ton of new features for business accounts. The new My Business Summary page presents notes from across the company, including a section for what’s trending and who’s new in your company. It’s like a splash page for your company to help you determine what’s happening at that moment. 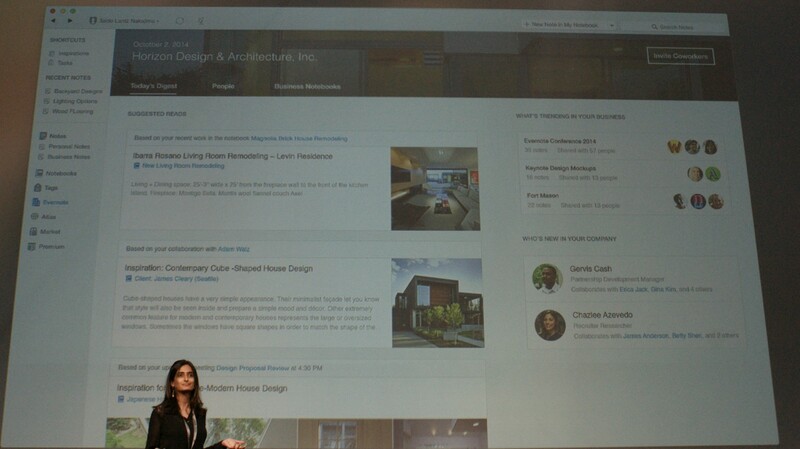 Another feature called Context now expands upon the related notes feature by presenting people both in your company and from LinkedIn based on what you’re writing in your note. For example, if you’re writing about Tim Cook, his LinkedIn profile will be presented. Context will also present not only our related notes, but also the related notes from your coworkers. Plus, it will present articles from publications includingFast Company, The Wall Street Journal and others that can be cited in your note via copy and paste. With the Presence feature you can see who in your team is looking at company notes. 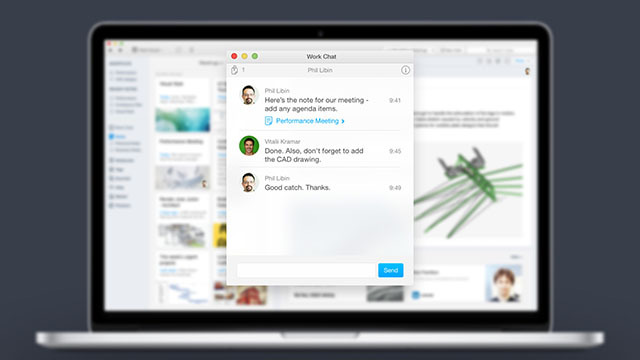 But it’s also a taste of Evernote’s new feature that brings messaging to the note service. Work Chat lets you talk not only with your coworkers but also anyone that you’ve connected to via Linkedin. You can chat about a note and even send your notes to collaborators. Libin says this has been one the most requested features for the service. All of the business features will be available in November.